Next: What’s a Conflict of Interest Policy? 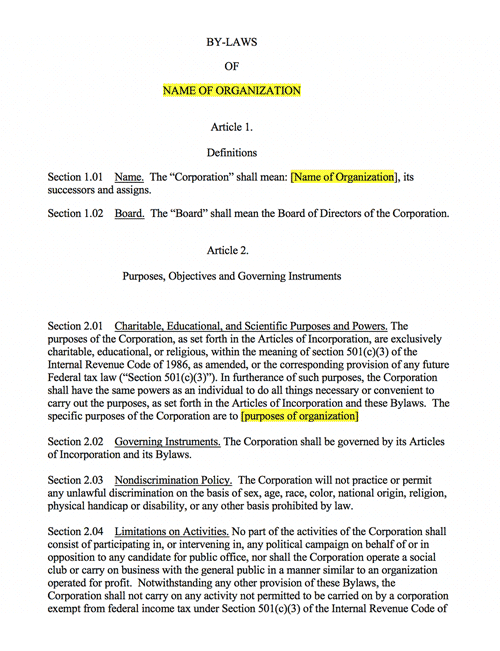 Nonprofit bylaws are the main governing document for your nonprofit corporation. They supplement the rules already defined by the state corporations code and will guide how the nonprofit is run. When you pursue federal tax exemption, the IRS will ask you to either attest to the fact that they have been adopted or request that you attach a copy to your application. This document guides the actions and decision-making of the board of directors while helping to prevent and/or resolve conflicts or disagreement. This bylaws template was drafted by an attorney. This document is intended to be used as a sample or model only. Some of the information provided in this template may or may not fit the needs of a specific organization. Use of this template should not be construed as legal counsel or substitute the advice of an attorney. How do I add individuals to my board of directors? What if a director wants to resign? How long can someone serve on my board? These are common questions that we receive, all of which can and should be answered in your bylaws. A nonprofit organization should not operate without bylaws. Your bylaws answer these and other questions while following any applicable state statutes. It is important to regularly review your bylaws to ensure that they reflect how the nonprofit works. From time to time, It may be necessary to amend your bylaws. The process for doing so is outlined within the document. Note any revisions, track amendment dates, and report changes to the IRS on your annual Form 990. You may use our free bylaws template as a starting point. Bylaws, following applicable state statutes, are the main governing document for your nonprofit corporation. Your bylaws answer common questions about how the board of directors and nonprofit function. It is important to regularly review your bylaws to ensure they reflect how the nonprofit works.